Lucky Orange is an Application designed to fully expose a customers journey and actions on your site. The data captured is extremely powerful because it can help solve the question most ecommerce store owners ask, “Why aren’t my visitors buying?”. Conversion optimisation is a top priority for all store owners and if it isn’t, it should be. Most Shopify store owners believe that more traffic = more sales. Whilst this is a fairly true statement, most store owners miss an obvious trick. What if you can get more of your current traffic to check out? 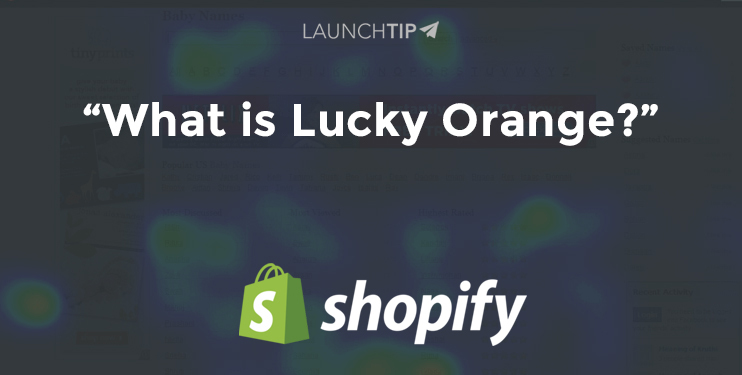 Lucky Orange can help you answer the question of why more that 95% of visitors that visit your store don’t buy. Watch anonymous recordings of visitors navigating and interacting with your store, just like watching a film. You will be able to see every mouse movement, click, and scroll which will help you answer the question of what are visitors really doing on your shopify store? Perhaps they never see your call to action button, or maybe it doesn’t even work. Discover a wealth of information in seconds with lucky orange’s visitor recordings. This is a great way to see your site being used through the eyes of your customers. Store owners can often get “comfortable” with their Shopify stores and whilst they may know where everything is in the store and how to navigate it easily, this may not be the case for a fresh customer. Collate thousands of visitors browsing data into heat maps which show you how people click, move, and scroll all the pages on your store. This is a great way of exposing the “hot” areas of your site. If you see customers are clicking something that you thought wasn’t important, you can move it to a more prominent position and get even more customers seeing it. Imagine you have a product on page 3 of a collection which is really popular? You could display this on your homepage and push even more sales. Ask your visitors quick and non-intrusive poll questions, such as “Is there anything preventing you from making a purchase today?” Gain valuable and actionable information on a first hand basis. You’d be surprised how many customers actually like to give feedback. A simple question with a small intro to show the customer you value their input can make them feel valued and gain you some crucial feedback. Talk directly with your customers with Lucky Orange’s fully featured chat system. You can even watch their screen while you chat with them as well as point to areas directly on their screen for further clarification. You can get the Lucky Orange App from the Shopify App store. It includes a free 7 day trial and plans range from $10 to $50. Installation is straight forward and requires no coding. This is a serious App and can help you get deep into your customers behaviours. You can then harness this data and information to make your customers lives easier and better. If you want help with improving your conversion rate, check out our LaunchTip Support plans. Previous Post The Ultimate Guide to Google Shopping Next Post What is Kartify and how can it improve the Shopify Cart Page?